Does your daily work commute involve Metra? Have you considered riding your bike to the train station, but are unsure what route to take, how to ride safely, and what to wear? Or, are you looking for a way to encourage fellow Metra commuters to ride? Download one of our Bike to Metra guides for 39 communities throughout the region. The guides include recommended routes and safe riding tips and are available for free at Metra stations and other community locations. Although the focus is on trips to Metra stations, the maps can also help residents and visitors select routes to other destinations, such as shopping and recreation areas. Some communities have even used them as starting points for bicycle planning efforts. From 1998-2008, there was a tripling of Chicago area residents riding to and parking their bikes at their local Metra commuter rail stations, as part of their work commute. Others not only bike to Metra, but also bring their bikes on-board during reverse commute and off-peak hours. And, the bike + transit option is not just great for commuting; trails, shopping centers, museums, sporting venues and other popular destinations around the region are located within easy biking distance of a Metra station. 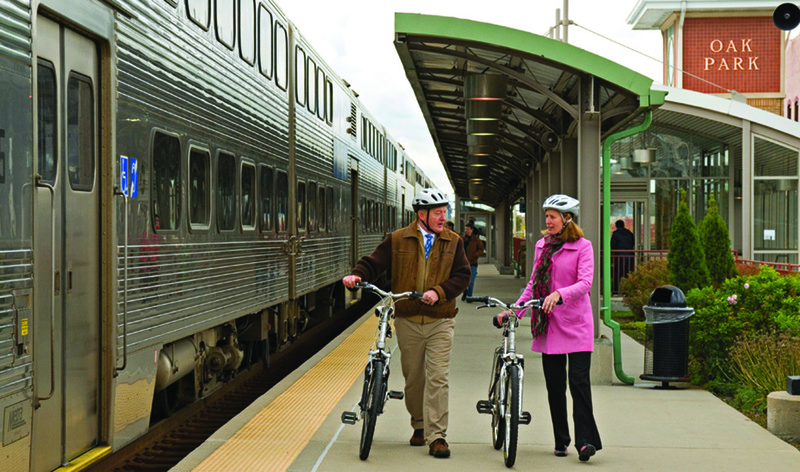 In 2007, Ride Illinois and the City of Aurora developed two ”Bike-to-Metra” guides to encourage even more people to ride their bicycles to Aurora’s Metra stations. In 2009-10, thanks to a federal “Congestion Mitigation and Air Quality” (CMAQ) grant, and sponsorship by then-Lt. Gov. Pat Quinn and DuPage County, the guides were replicated and tailored for 20 other Chicago-area towns. In October 2011, CMAQ continued its support with a “bicycle encouragement” grant of $76,800 to the Village of Schaumburg for Ride Illinois to produce and print guides for 15 additional communities. We are grateful to Schaumburg and CMAQ for their support, as well as all the communities that participated.